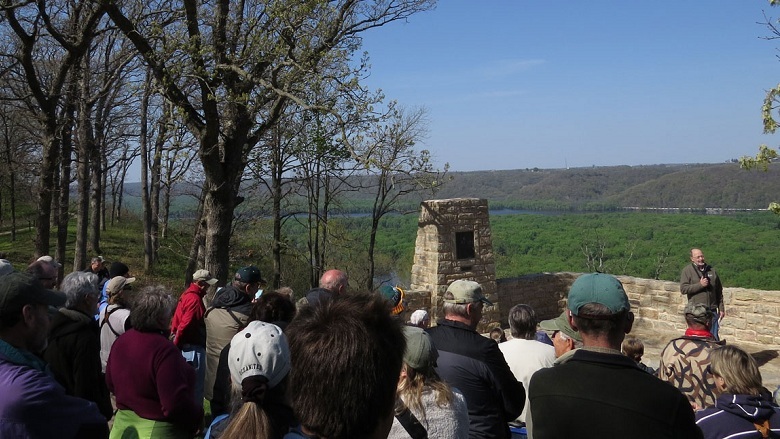 Stanley A. Temple addresses the audience at the May 17, 2014, rededication of the Passenger Pigeon Monument at Wyalusing State Park. Temple, who led the effort to restore the 67-year old monument, has traveled the U.S. this year on a speaking tour in observance of the centenary of the extinction of the species. It’s hard to imagine today that the bird was once so abundant that flocks darkened the skies for days as they passed continuously overhead or that one bird in every four in North America was a passenger pigeon. It is also hard to comprehend that in just half a century of unregulated overexploitation we killed them off entirely. The last wild bird was shot in 1902, and in 1914 the last surviving bird, a female named Martha, died in her cage at a Cincinnati zoo. Today, a century after the bird’s extinction, the tragic story of the passenger pigeon needs to be retold—not only because most people have forgotten it, but also because it provides important lessons for the present and the future as we confront an unprecedented mass extinction of species as a result of our actions. To take advantage of this “teachable moment,” I have joined with other conservationists in creating Project Passenger Pigeon. We are dedicating 2014 to the commemoration of the centennial of the extinction of the passenger pigeon. Already I have devoted much of this year to helping lead the effort to tell the story of the passenger pigeon, and to cramming as much public outreach as I can into the centennial year. My outreach efforts will culminate this fall in a weekend of commemorative activities in Madison (see page 14), co-hosted by the Wisconsin Academy. The weekend will feature a diversity of pigeon-related events: lectures, a screening of a new documentary film, a staged reading of a play, a performance of a pigeon-inspired symphony, and much more. My various outreach efforts over the last few months have already given me a chance to interact with thousands of individuals from the conservation community and the general public. Several observations, some encouraging and others troubling, have emerged from these interactions. Now, as we observe the centennial of the passenger pigeon’s extinction, Leopold’s prediction has seemingly come true. It’s hard for people today to empathize with the national mindset of the 19th century, a time when the wildlife resources of the continent must have seemed inexhaustible. It was also a time when the exploitation of wildlife resources was almost completely unregulated. I have been dismayed by how many Americans don’t understand what we did to the passenger pigeon and almost did to other species such as the wild turkey and American bison that were hunted commercially to near extinction. Each year, wherever they attempted to nest, passenger pigeons were slaughtered by the millions for their meat by thousands of professional market hunters and locals who converged on the nesting colonies. The disturbances caused by the nonstop killing made the birds abandon their nesting attempts. Killed on an industrial scale and prevented from reproducing, the pigeon’s extinction became a mathematical certainty. It’s now almost inconceivable how such a decimation of wildlife was tolerated for so long before anything meaningful was done to curtail it. The wild pigeon, formerly in flocks of millions, has entirely disappeared from the face of the earth. We have given an awful exhibition of slaughter and destruction, which may serve as a warning to all mankind. Let us now give an example of wise conservation of what remains of the gifts of nature. Other legislative and regulatory actions of the early 20th century were similarly motivated by the pigeon’s shocking demise and made specific reference to the bird. Although these actions came too late to save the passenger pigeon, other species that were nearing extinction benefited and recovered once protection and management were in place. Questions from audiences I talk to frequently deal with “What if?” scenarios: If we had acted in time to save the passenger pigeon, could we have then coexisted with it in the modern world? Or would we have switched from killing them for commodity to killing them for the damage they could do to crops or other reasons of general nuisance? The possibility of “de-extinction” and the fascination of many of its proponents with using emerging biotechnologies to resurrect the passenger pigeon from remnant DNA in museum specimens evokes mixed reactions in all my audiences. Some are initially captivated by how utterly “cool” it would be to give the species a second chance, but upon further reflection most worry about unintended consequences and the ethics of genetically engineering life in the name of conservation. Others worry that if extinction is no longer a permanent state, the conservation movement is likely to lose more than it gains. Species might be tacitly allowed to become extinct because we can always preserve some DNA and bring them back in the future. With so much current attention focused on the impacts of habitat loss, invasive species, and climate change, it is easy to forget that direct overkill (i.e., humans killing animals faster than they can reproduce and replace the losses), while no longer a major threat to wildlife in North America, is a major threat to many species across the globe. We need only remind ourselves of things happening at this very moment—overfishing and the collapse of commercially valuable marine life, poaching and illegal trade in high-value products from species such as elephants and rhinos, or the persecution of species that prey on domestic livestock—before questions arise about what can and should be done to protect these and other species. This is when the lesson of the passenger pigeon becomes most relevant. We addressed overkill in North America by instituting legal protection for wildlife, by learning how to exploit wildlife resources sustainably (but not commercially) and by ensuring that resources for both protecting and managing wildlife are adequate to prevent deliberate overkill. We changed a culture in just a generation. We proved it was possible to relegate overkill to the dustbin of history. One hopes that a hundred years from now we will look back at the 21st century as the period in which direct overkill by human activities is finally eliminated as a threat to wildlife throughout the world. This means that some types of overkill simply need to be banned, and all forms of wildlife exploitation need to be done sustainably. Existing legal protections need to be more vigorously enforced. And endangered species need more protection and management, not less. Perhaps reflecting on the passenger pigeon in 2014 will help these things happen. Wisconsin has played a recurring and significant role in the passenger pigeon story. The state was a principal nesting area for the bird and, in 1871, hosted the largest nesting colony ever recorded. It covered over 850 square miles of central Wisconsin with pigeons nesting in almost every tree. It was the scene of a well-documented, massive slaughter of the birds. Martha, the last passenger pigeon, was almost certainly born in Wisconsin in 1887. The Passenger Pigeon Monument at Wyalusing State Park stands as a permanent reminder of what we have lost. Aldo Leopold’s “On a Monument to the Pigeon” is considered by many to be one of the most poignant essays ever written about human-caused extinctions. He subsequently included it among the essays in his classic book, A Sand County Almanac, which has been read by millions. We who erect this monument are performing a dangerous act. Because our sorrow is genuine, we are tempted to believe that we had no part in the demise of the pigeon. The truth is that our grandfathers, who did the actual killing, were our agents. They were our agents in the sense that they shared the conviction, which we have only now begun to doubt, that it is more important to multiply people and comforts than to cherish the beauty of the land in which they live. What we are doing here today is publicly to confess a doubt whether this is true. This, then, is a monument to a bird we have lost, and to a doubt we have gained.